I am excited to announce the general availability of the Mule 3.4 release. Mule 3.4 introduces new capabilities across Mule ESB, CloudHub, Mule Studio, Anypoint DataMapper, Anypoint Connectors, and the Anypoint DevKit. There are three main areas around which Mule 3.4 introduces innovations that we believe greatly change the traditional ways in which integration is approached. The first is through the Studio Visual Flow Debugger. The Studio Visual Flow Debugger enables all of the goodies you could imagine such as the ability to place breakpoints (including exception and condition based ones) on flows, examining and modifying message content in flight, and navigating through the flow in debug mode. What is more, Visual Flow Debugger not only allows you to do all this on the embedded Studio runtime, but it also can be used to debug flows on a remote Mule server as well as flows deployed to CloudHub. Second in line is Mule’s new and improved High Availability (HA) solution. Prior to Mule 3.4, the Mule HA solution already enabled linear scalability and reliability for Mule applications. In 3.4 these features have been enhanced with support for parallel and distributed polling (as opposed to single-node polling) for File, FTP, and SFTP servers. We have also added the ability to add and remove new nodes to and/from a cluster dynamically – without service interruption – through the Mule Management Console. The last sets of features in this area are all around developer productivity. With our 3.4 release we are addressing a number of the most important developer needs when it comes to integration. 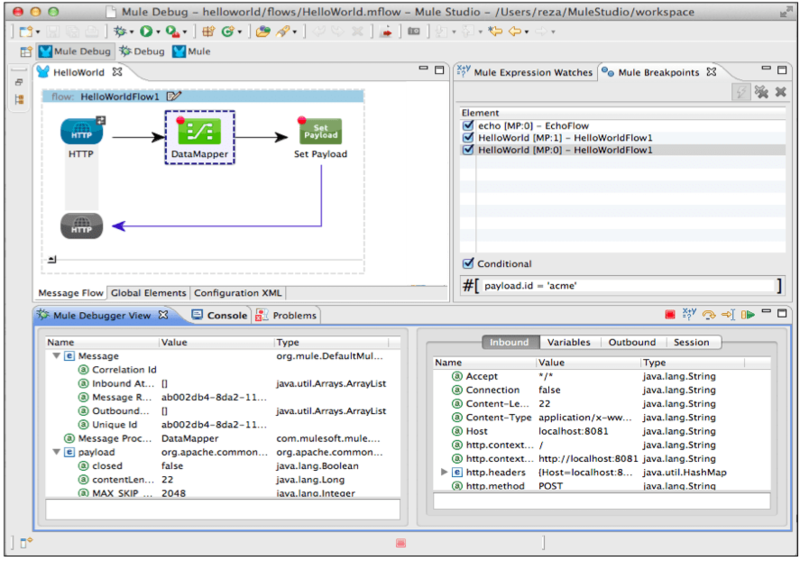 These needs include seamless use of Maven from Studio, the availability of Studio as Eclipse plugins available through an update site, and augmented Studio refactoring tools such as the possibility to move multiple nodes from a flow into a sub-flow or scope with a single click or the ability to modify DataMapper input and output meta-data on a per field bases without losing the transformation logic. The enterprise needs of today’s organizations have changed dramatically from that of only a few years ago with enterprises having to face a plethora of integration points across SaaS, cloud, social, and mobile, which reside outside of the boundaries of the firewall. The need to connect legacy systems, packaged applications and now all these new endpoints beyond the firewall is a major undertaking. This is what we call the New Enterprise and Mule 3.4 is built to take on the challenge. We start with a new technology named DataSense. DataSense is designed to greatly simplify SaaS integration by dynamically discovering meta-data such as operations, object model, and data types for SaaS endpoints through Anypoint Connectors. This means that you no longer have to refer to the documentation of your SaaS endpoints in order to deduce their input/output objects and types. Once you have discovered the data model of your SaaS endpoints, you now need to be able to map between their different data types. This is where the second area of New Enterprise innovation in Mule 3.4 comes in: DataMapper enhancements. Firstly, we have enabled DataMapper with DataSense support. This allows DataMapper to automatically discover the object model from connectors within a flow and automatically perform any mapping that seems obvious between its input and output. A demo is always worth many thousands words and this is specially the case for DataSense, so have a look at the following short viewlet (click on the image) that showcases DataMapper’s integration with DataSense to perform a SaaS integration with Salesforce. Beyond DataSense support, DataMapper has been turbo charged with many other new features in Mule 3.4 including support for data streaming, new data formats (flat file and variable delimiter), and the ability to use another Mule flow’s result as a lookup parameter. The final New Enterprise feature area that we are introducing in Mule 3.4 revolves around the newly announced Anypoint Service Registry product. Specifically, Mule 3.4 is integrated with the Anypoint Service Registry with out-of-the box support for its full set of capabilities, including policy management, contract management, service virtualization, and service analytics. This support is provided across Mule Studio, Mule ESB, and CloudHub environments. 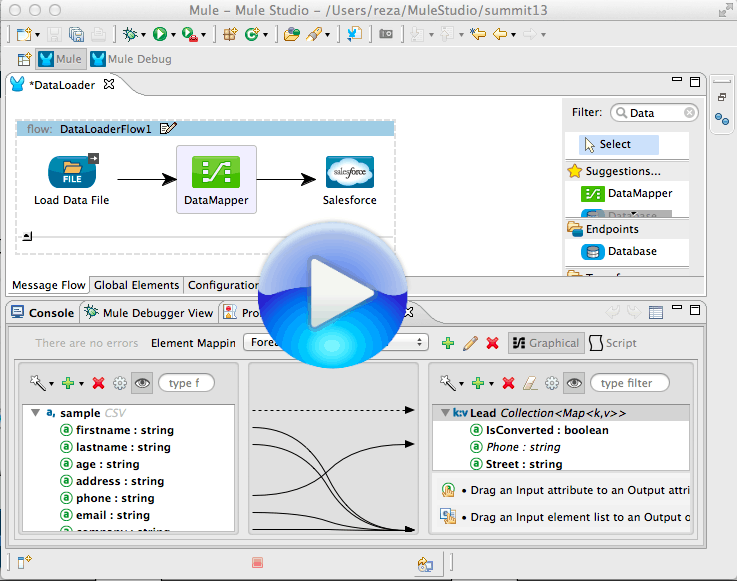 Get Started with Mule 3.4 Today! With two public early access milestones as well as a public beta, and with over 150 beta users, we are highly confident of the solidity and quality of this Mule release. We look forward to having our community and customers take advantage of Mule 3.4’s many new features. We hope that you get started with trying out Mule 3.4 today by downloading Mule Studio. Enjoy!